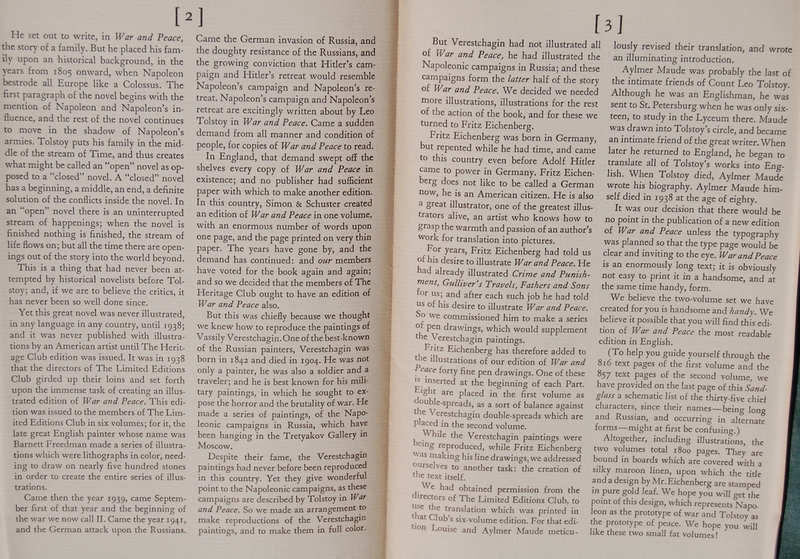 Heritage Press Exclusive; the LEC printed their own edition of War and Peace in 1938. This edition borrows the revised translation done by the Maudes. Front Bindings – Hello again, everyone! It’s nice to be back. And this is my first post in my new home. Funny how this doesn’t feel any different, and yet…this is the first time I’ve not lived in my home town. So many other parts of my life are so radically different from before, but it’s comforting to know that writing here is a little nostalgic in its own strange way…Anyway, you’re not here necessarily to read about my life changes. 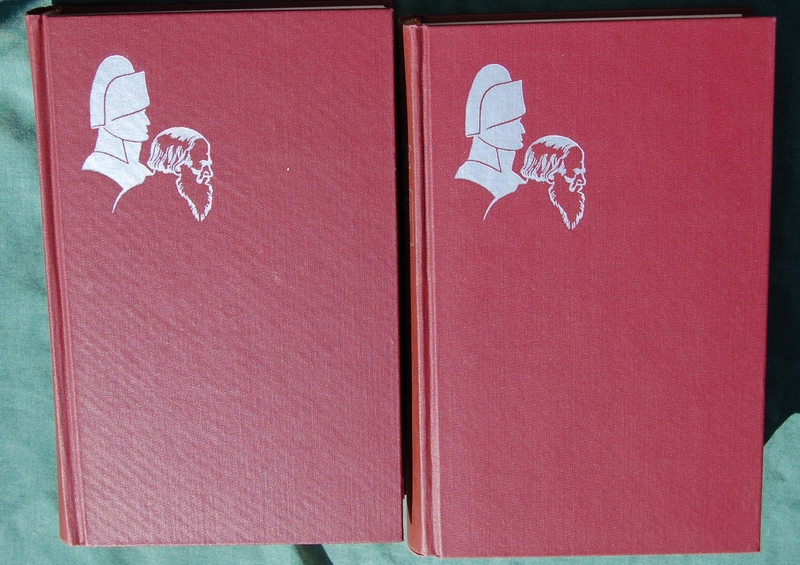 Let’s get to brass tacks and discuss a monstrous two volume set that stars two illustrators: the Heritage War and Peace. 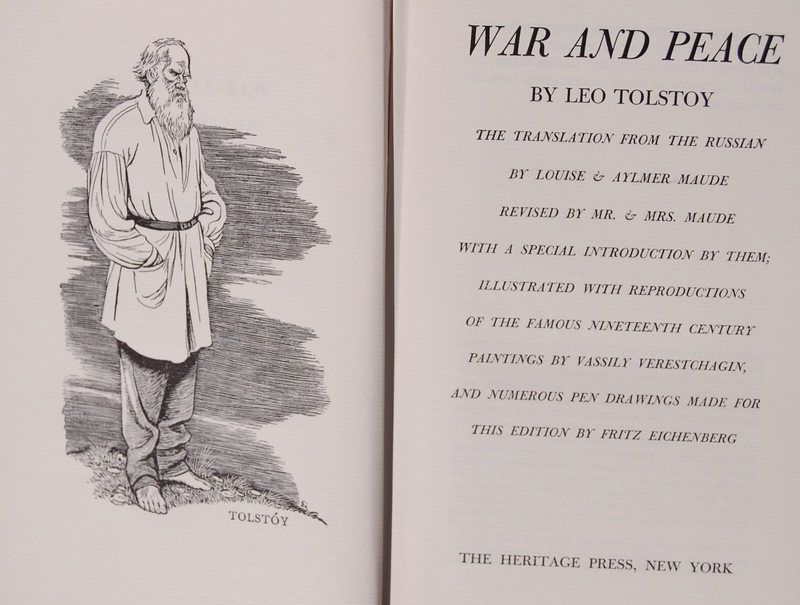 War and Peace is arguably the great Leo Tolstoy’s magnum opus; the George Macy Company agreed with this sentiment, publishing two versions of the classic, one for each publishing house (which was also done with Anna Karenina, but gave that particular book two LEC editions instead). 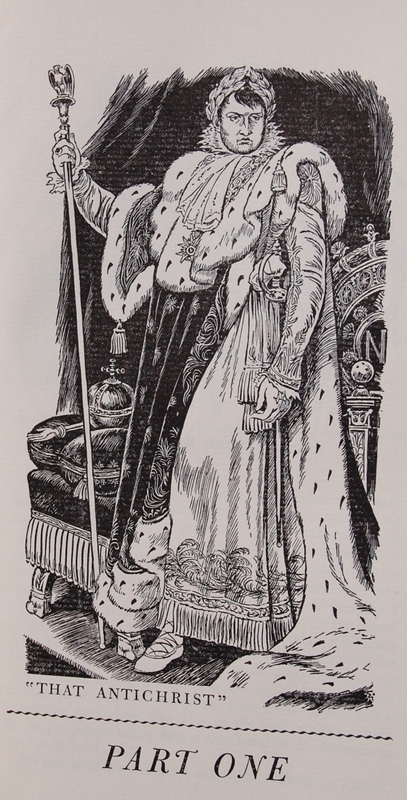 The LEC received a six volume set in 1938, decorated by the esteemed Barnett Freedman (who also did the art for Anna Karenina). The Heritage Press, meanwhile, received this two volume set later in 1943, starring another prominent illustrator of Russian texts, Fritz Eichenberg. 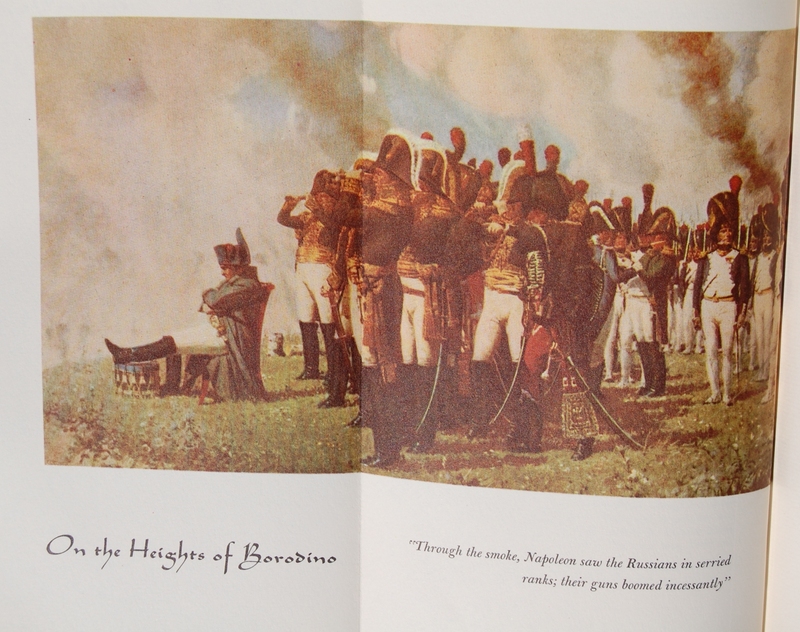 Eichenberg wasn’t alone on this edition, however; Macy licensed the paintings of Russian painter Vassily Verestchagin, who was at the time unpublished in the United States, to decorate the battle-filled second half of the book. Eichenberg is primarily reserved for the first volume. Before you get super excited, though, Eichenberg left his woodcutting tools out of the equation for this commission, and instead went with a simpler inked line approach for his artistry. It’s certainly adequate, but may not be as well-received as his exquisite woodcuts and lithographs that grace other Macy volumes. Tolstoy and Eichenberg would meet twice more (with his patented woodblocks) in the future for the LEC, with Resurrection and Childhood, Boyhood, Youth seeing his flourish in 1963 and 1974, respectively. Tolstoy’s publishing history with Macy is detailed in Anna Karenina, and Eichenberg’s is covered in The Brothers Karamazov. Jerry, your Sandglass is the same as mine and dates from the initial HP release in 1943. 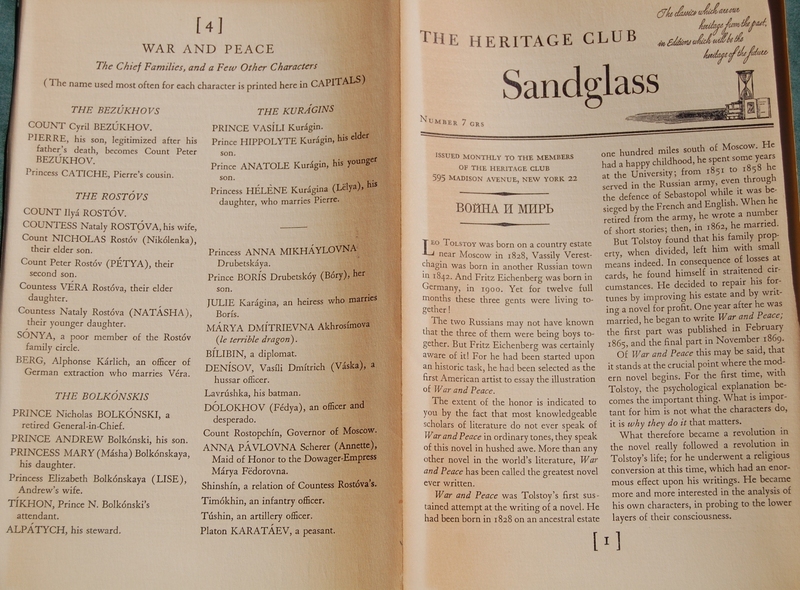 When War and Peace was re-issued in 1951, it was in a single volume and the Sandglass didn’t have any details on the production either. In your article you mention that since Freedman died in 1958, that this edition dates from then. 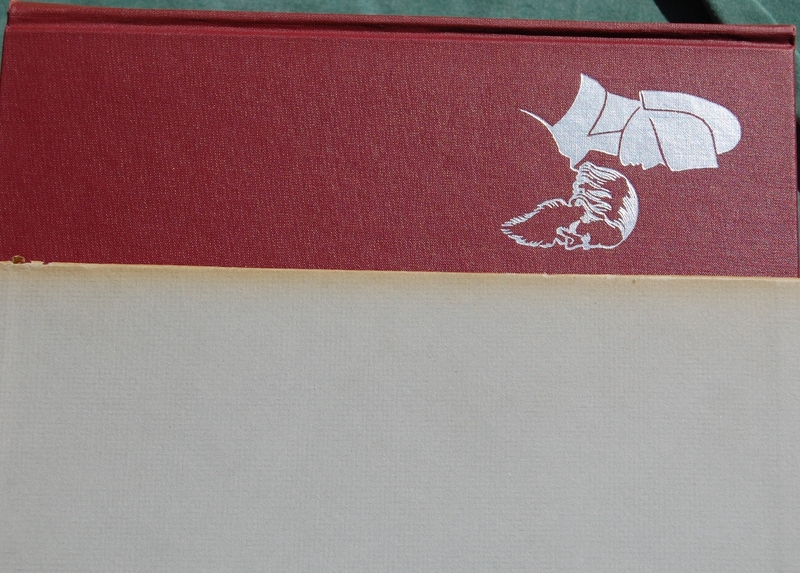 It is one of those little details that make the collecting of HP editions a fascinating game of detective work! In fact, this statement proves how strange things were for Macy during the war, and how much confusion existed in those days before satellite communications. In fact, Macy, and many others, I’m sure, believed that Freedman had died serving as a War Artist–having been sent to France in April 1940 to record the work of the BEF–either during the near-disaster of Dunkirk, or being lost when the Bismarck sank HMS Hood, with with virtually the entire ship’s company. Freedman was nearly lost at Dunkirk when he left the complement of War Artists to retrieve the one painting he had completed before the Germans forced the evacuation. As told in the wonderful book The Sketchbook War: Saving the Nation’s Artists in World War II (which features the exploits of several LEC illustrators), Freedman had “a last defiant meal on French soil before leaving the burning city–three bottles of champagne and a tin of bully beef” before getting on an ammunition boat which brought him to England. After this, he was posted, not on HMS Hood as Macy thought, but on HMS Repulse, which was one of the ships that sank the Bismarck. This is undoubtedly the origin on the comment “late, great painter” in the 1943 War and Peace Sandglass and the comment in the 1951 War and Peace Sandglass that Freedman was a survivor of the sinking of the Hood (in fact there were only two survivors) and a survivor of Dunkirk. Isn’t that fascinating? Once again, World War II wrecks havoc on Macy’s plans, much like it did with Oedipus the King, This is the Hour, and Le Fleurs de Mal, among others. At least this one had a happy ending, and Freedman lived through his trials as a war painter (to ultimately come back and do Anna Karenina!). Funny how this post has been a bit of a circle, and how War and Peace seems to be an actual theme to the events of Macy’s artists, too! 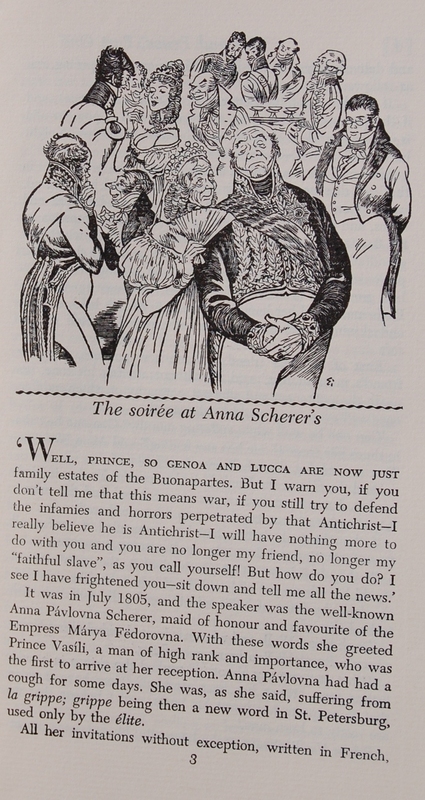 Title Page – The text is taken from the LEC edition of War and Peace, which featured a modified translation by noted Tolstoy scholars Louise and Aylmer Maude. The latter also provides an introduction and many notes to the text. Macy made plenty of his own notes of how this is an exclusive to his printing houses, so he must have had some pride in acquiring it. Part I Opening – Eichenberg’s linework is nice, but I do admit that his woodworking skills would have been preferable. They’re just so amazing, and while these sketches are also high quality, they lack the dynamism his woodcuts emote. Page 207 – Verestchagin was a soldier, and his paintings suggest the wear and glory of being involved in a major war. Page 637 – Adore this one. Personal Notes – This is a set I’ve wanted for some time, and it came in the bunch of Heritage titles I acquired from the Oakhurst Library. Still need to read it, though. 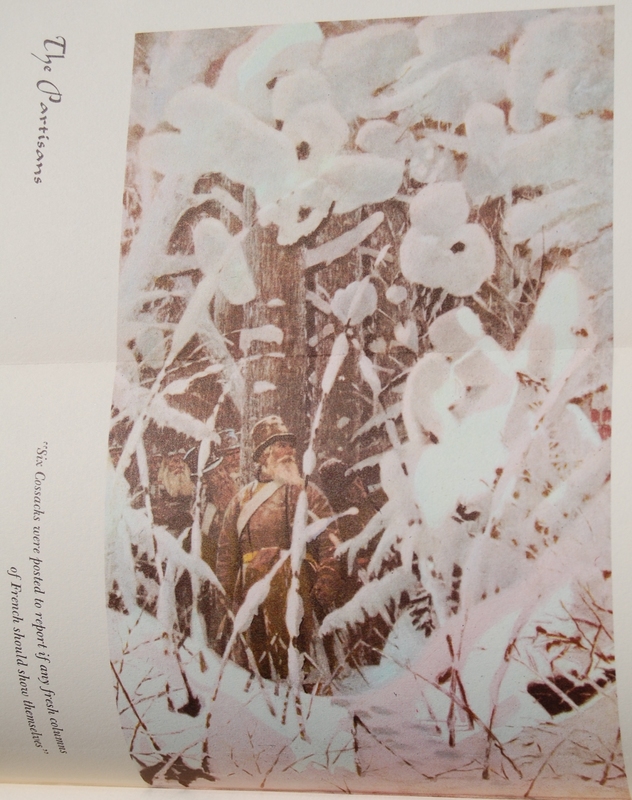 You are currently reading Hertiage Press – War and Peace by Leo Tolstoy (1943) at The George Macy Imagery.